In 2003, Jeremy Swain, (the Chief Executive of London-based homelessness charity Thames Reach), launched a campaign called Killing with Kindness. Posters on London's tube network tried to deter people from giving to beggars in the street, instead urging them to give to charities and organisations working with threatened groups. I think the campaign is a worthwhile one, but question whether the beggar's loss may actually decrease donations to the charitable sector working with the homeless. The campaign resurfaced in October, when Jeremy posted an article entitled 'Do The Right Thing' on Inside Housing's website, after discussing it in a radio interview. He pondered the 'psychology of giving' when we drop money into used Starbucks cups on the streets, asking who exactly we are helping by giving money to beggars. Whilst we may be easing our own consciences, he writes that there is 'incontrovertible evidence that the vast majority of people begging on the streets are doing so in order to purchase hard drugs, like heroin and crack cocaine'. As a result, our 'compassionate' giving may in fact be trapping people in a lifestyle of instability and substance misuse rather than helping them to move on. Swain instead proposes that people should give their money to organisations working with individuals affected by homelessness and substance misuse as this is a more sustainable and effective way to help people. Jeremy told the story of Cheryl, a habitual beggar working outside Charing Cross station to support her heroin addiction. Cheryl felt people often knew of her habit but chose to ignore it out of ignorance or pity. This careless attitude of givers enrages Jeremy, as he points out that often such addicts will die from their addiction, and such acts of giving in fact undermine the hard work of frontline support workers. Cheryl escaped her situation when she enrolled on a treatment programme, and the argument seems to be that if we thought a little more about which hands our pound coins fall into, we could dramatically reduce the numbers of beggars on our streets. This is, after all, the ultimate aim. Many agree with Jeremy. Dave Hill recently wrote an article for the Guardian 'Don't give money to beggars - help them instead.' With a similar logic to the Killing With Kindness campaign, he wrote that 'most rough sleepers don't beg and most beggars aren't rough sleepers' and instead urged us to give our money to a 'relevant charity'. I can say that from my experience with The Pavement Perspective I agree with this statement - most rough sleepers I have met are either managing on minimal weekly benefits or otherwise doing casual work to keep themselves afloat. However, whilst I am confident the campaign will be able to stop people giving money to beggars, I am not so sure it will have such a positive effect for charitable organisations. 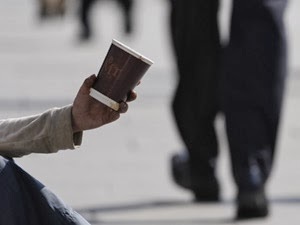 Whilst it is unclear whether the money not dropped in beggar's cups will translate to charitable gain, I see a risk that donations overall may decrease. This concern stems from the risk that the campaign will reinforce negative stereotypes about rough sleepers, and also give people one more way to justify their dismissal of vulnerable people on the streets. Many people already think of rough sleepers and beggars as synonymous, and assume they are 'all drug addicts' or 'drunks' and this campaign might 'confirm' their suspicions. People might feel they do not want to give their hard-earned wages to help individuals they perceive to have brought their problems upon themselves, and this may actually reduce the amount of money homelessness charities receive. Furthermore, I think most people probably give to beggars due to spare-of-the-minute guilt and the rest of the time give very little thought to those on the streets, be they homeless or not. If they are given a campaign which actually justifies their dismissal of people on the street, it gives them one less reason to take any action at all. Although the campaign may do good work in stopping the counterproductive task of giving to beggars funding drug habits, I am not sure that the public en mass will necessarily understand the background context of such a nuanced campaign. 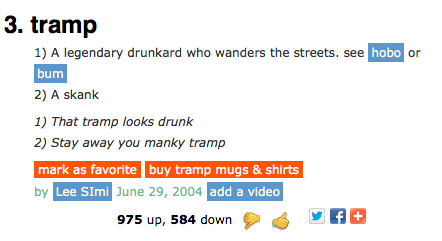 My concern is that it may be used as an excuse to disregard issues surrounding people on the streets altogether. Nonetheless, as Jeremy has pointed out to me, cutting the supply of money to dealers is the main primary aim of the campaign, which is a necessary and important task. Any other side affects are merely speculative on my part, and judging by the ongoing success of organisations such as Thames Link, despite the release of the campaign in 2003, I may well be wrong that donations to charities will reduce! In reality, the issues surrounding homelessness and addiction are complicated, and as a result raising awareness is a difficult task. The issues are complicated because they are people's lives, each story is slightly different and there is no homogenous groups of 'homeless' or 'beggars' who can be captured and matched to a single solution. It is debatable whether there is ever one 'right' thing to do - you have to use your own discretion in each situation. In the meantime, I think Swain's campaign gives us all food for thought, but lets hope it is interpreted correctly. Great post! Like the poster too. If you were to encourage people to donate to one of the many homelessness charities which would it be? Well, all the organisations working with homeless individuals in London (and beyond) do a fantastic job, but in the end it boils down to personal preference. If you are interested in solutions, a charity which does a lot of lobbying for more housing and better provisions may be up your street, (Shelter, Housing Justice, to name a few) whereas if you are interested in direct outreach work you needn't look further than your local shelter or day centre. You can just Google your area to find one close to you. The advantage of giving to a smaller organisation is that you are more likely to see the tangible benefits from your donation. However, sometimes the larger organisations effect the bigger changes - on both sides of the fence, donating will be money well spent. Frankie - this is a very interesting and balanced assessment of the Killing with Kindness campaign, in my view. I thought it would be useful to provide a little more context. Rather than re-launching the Killing with Kindness campaign, what happens is that Thames Reach is approached by different local authorities and other bodies around the country who ask permission from us to use the image. We invariably agree and if it is being used in a a city or town where we don't work, we do not ask for any 'alternative giving' donations to be given to us but to local agencies. The Inside Housing article I penned recently on the subject was in a sense spontaneous as I had gone on the radio to discuss the issue the week before and it was fresh in my mind again. This is a campaign we have run since 2003, indeed I see that the version of the image you are using includes our old name of Thames Reach Bondway! 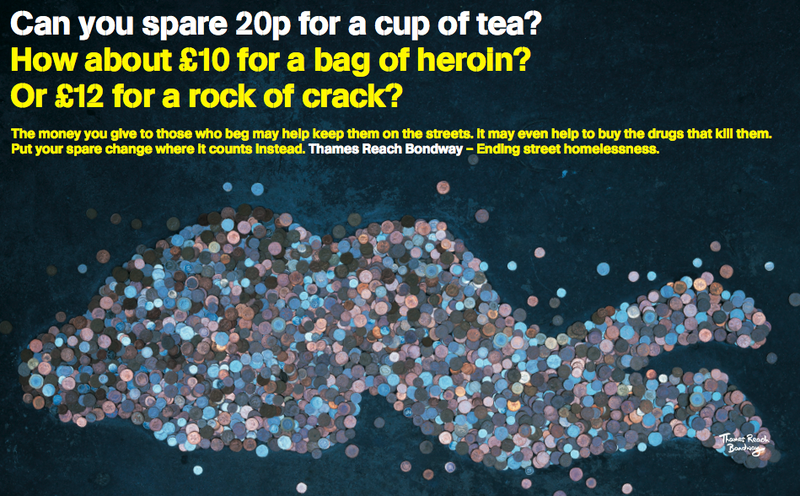 But the main point I wanted to make is this: The objective of the campaign is first and foremost to make sure that we cut off the supply of money to the dealers and alongside this can assist people with substance misuse problems to seek help with our support, which becomes a more likely proposition when the supply of begging money reduces. Giving the public an alternative - i.e. supporting a local charity working with the homeless instead - is important but this will not generate much, if any, income for charities because, as you imply, giving to people begging is spontaneous and, I would argue, unthinking. So this is not meant to be a a fund-raiser but a life-changing campaign. Hope this is useful. Thanks for your comments and clarifications about the campaign, Jeremy. They were very helpful and I have amended the post accordingly. If you have time, let me know what you think. I appreciate that in trying to critique the campaign I overemphasized the direction of funds rather than the obvious primary aim of helping people overcome substance misuse and addictions. The concern I was trying to express is that the general public en mass may conflate the often distinct groups of ‘beggars’ and ‘the homeless’. As a result, the campaign could be used as another excuse for people to disregard not only rough sleepers they see on the streets, but also the charities that help them, relying on the misguided assumption that ‘they are all drug addicts’ etc. I hasten to say that I do not think this is the correct interpretation, but it may well be the one some take, and if they do it may result in fewer funds reaching charitable organisations working with homeless individuals in the first place. Overall, I think the campaign is a very good one, and presumably having a positive effect. Conveying such complex messages, which necessarily do require a lot of explanation, is never going to be easy. I will send you an invitation to the first screening of our film, The Pavement Perspective, to see if you might be interested in more of our work. Are you happy for the old image to be used on the blog? If not, please do let me know. Frankie - thanks. No problem with the old image being used on the blog and I wasn't asking for the blog to be amended as I thought that your points were all well made, even if I might not agree with them all. To avoid the stigmatising of homeless people as all being drug addicts we have consistently stated that the link is between begging and drug misuse, not between homelessness and drugs or even homelessness and begging. However I accept that this may not always get through to the public. Of course we would also be deluding ourselves if we ignored the fact that many people sleeping rough do have drug and alcohol problems with the figures in London over the last decade consistently holding at around 30% of people sleeping rough addicted to hard drugs and over 40% of rough sleepers having problems with alcohol (and notably addiction problems that involve super-strength lagers and ciders). We also know from recent and very convincing research that the problem precedes the rough sleeping - that is, the substance misuse problem arises before someone sleeps rough though, of course, rough sleeping is likely to exacerbate the problem, hence our determination to get people off of the street as quickly as possible.